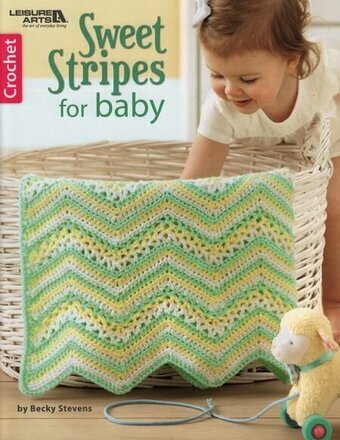 Sweet Stripes for Baby from Leisure Arts presents eight crochet baby afghans that create nursery pizzazz with simple stripes and interesting stitch patterns such as ripples, bobbles, and others. The three-color wraps are worked with one color at a time, but there are no loose ends to hide because unused colors are carried along the edge. Designed by Becky Stevens, the afghans include Playful Ripple, Berry Patch, Bouncing Baby, Waffled Warmth, Baby Shells, Bobbling Along, Gentle Waves, and Sweet Memories. All are Easy or Easy-Plus skill level and feature light or medium weight yarns. Dare to Be Square Afghans from Leisure Arts lets you enjoy the ease of making fabulous throws in one big square, using patterns that give the look of motifs and quilt-inspired compositions. Each of the eight crochet designs by Lisa Gentry produces a captivating pattern of rich colors, with some resembling the artistry of patchwork quilts. All for medium weight yarn and Easy skill level, the designs include Log Cabin, Earthy Shadows, Jewels, Patchwork, Patriotic Lace, Pink Passion, Crosses and Blocks, and Sand and Sky. While some patterns appear to use motifs, strips, or panels, each design is actually worked in one piece to form a square; sizes range from 48.5 inches to 58.5 inches square. When is an afghan more than just something to keep you warm? When it is itself a piece of art. And the 4 afghans in this collection are indeed works of art. These beautiful crochet designs by Kathleen Garen will add color and excitement to any room. Whether you choose to make the Postage Stamp afghan (a traditional scrap afghan in a modern guise) or the warm and comfy Double Puzzle, Heritage Quilt, or Rainbow Circle, these afghans are certain to enhance your reputation as an artist. 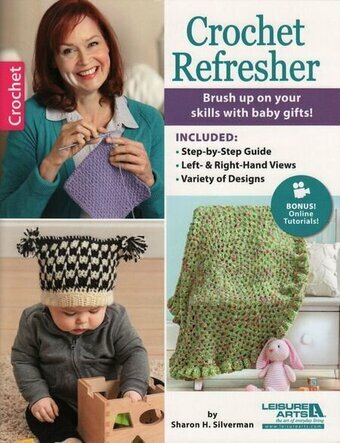 The baby afghans in this collection from Mary Maxim are perfect to crochet for your little bundle of joy or to give as a treasured gift. 7 Designs to make using sport or medium weight yarns: Sugar Spun Blanket, Baby Diamonds Blanket, Bears on My Blanket, Tiny Bubbles Blanket, Duckies Blanket, Peaceful Pastels Afghan, and Baby Diagonal Blanket. 32 pages. These sweet wraps are just right for a special infant. Terry Kimbrough's designs never skimp on charm, and this darling collection of 24 crocheted afghans is no exception. Patterns included: Special Memories, Snuggle Up, Sweet Dreams, Sotrytime, Playtime, Heirloom Lace, Welcome Home, Heartwarming Wrap, Woven Stripes, Exquisite, Lacy Ripple, Flower Motif, Timeless, Ruffles & Stripes, Pristine, Cable Puff & Lace, Enchanting, Simply Soft, Charming, Forget-Me-Not, Perfect In Pink, Lacy Little Afghan, Daisies for Baby, Baby Blanket. For colorful blankets that will delight Baby, choose from the fun crochet designs in Bright Baby Blankets, featuring Red Heart yarns. Best-selling Super Saver comes in more than 100 wonderful colors. Soft Baby Steps is the ultimate yarn for babies in fresh, no-dye-lot solids and coordinating prints. Sweetest of all, Buttercup has tiny pom-poms of color blended with a fleecy yarn that is squeezably soft. Projects include Hexagon Baby Blanket, Squares 'n Squares Baby Blanket, Monkey Around Baby Blanket, Cuddly Baby Blanket, Rickrack Baby Ripple Blanket, Broomstick Lace Baby Blanket, Polar Bear Blanket and Hat, and Coziest Baby Blanket Ever. 48 pages. Includes 48 motifs and four projects. The motifs are squares and hexagons that can be tiled together to make a fabric. The designer, Ellen Gormley, also included half motifs which are used to fill in the spaces and add shape. The motifs can be stitched together to create all kinds of projects from a coaster or washcloth to a wrap or afghan. As an extra bonus, we have included symbol crochet for each motif and project. The four projects include a scarf, hat, cowl and a blanket.